The Myers-Briggs Type Indicator® (MBTI®) assessment is a short, self- report questionnaire used to measure and describe people’s preferences for how they like to focus attention, get information, make decisions and orient their lives. 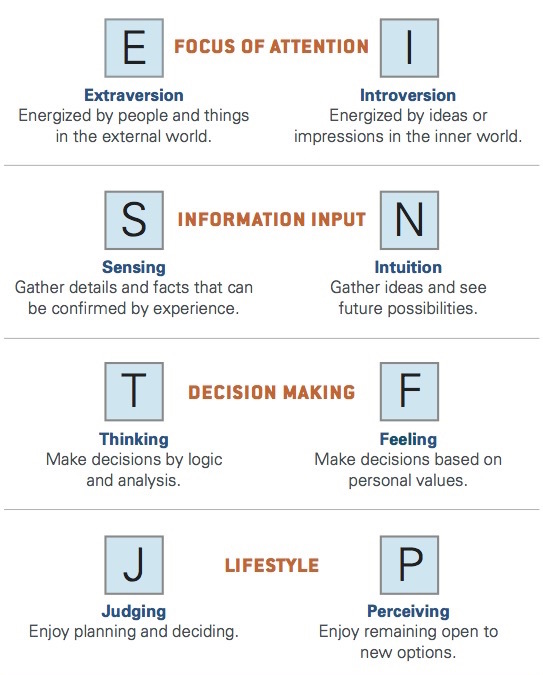 Created by a mother-daughter team, Katherine Briggs and Isabel Myers, The MBTI instrument was designed to make Carl Jung's theory of psychogical types understandable and useful in everyday life. • Describes rather than prescribes; it delivers back to you in an organized form the preferences you indicated when answering the questions. • Describes preferences, not skills or abilities. • Considers all preferences equally important and valuable. • Is well documented and researched with hundreds of scientific studies conducted over a 50 year period. ​Remember, there are no right or wrong answers to the questions in the MBTI® instrument. For each question, you should choose the answer that best describes the way in which you more often feel or act. Answer as you really are, not as you think you would like to be. What are The Benefits of Knowing Your Type? Greater understanding of yourself and others. Ability to understand and reduce conflict. Increased ability to manage change and reduce stress. Knowledge of your personal and work style and its strengths and development areas. Identify the jobs and tasks that give you satisfaction.